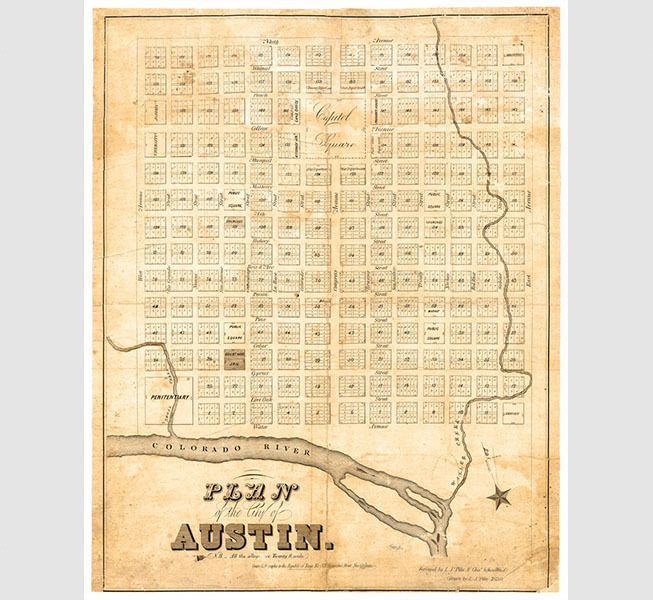 Plan of the city of Austin, 1839. 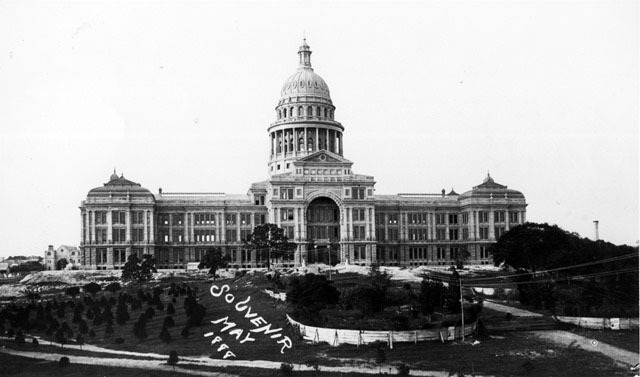 Image Courtesy Texas State Library and Archives Commission, 1/105-158. 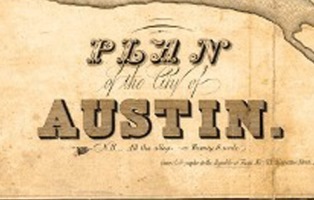 The Republic of Texas established a new capital named Austin. 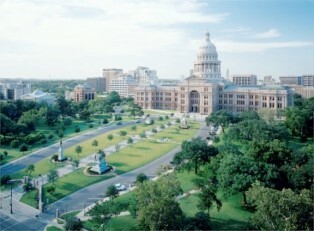 Edwin Waller laid out the city and designated an area on a scenic hill above the Colorado River as Capitol Square. 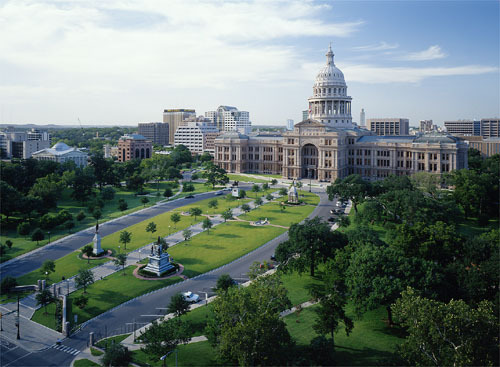 In 1852, Texas completed a limestone Capitol on the site that was later surrounded by stone walls, trees, and flowers. The Capitol Grounds showing debris from the 1852 limestone Capitol, c. 1888. Image Courtesy Texas State Library and Archives Commission, 1/103-45. The construction of the current Capitol left the adjacent property in poor condition. 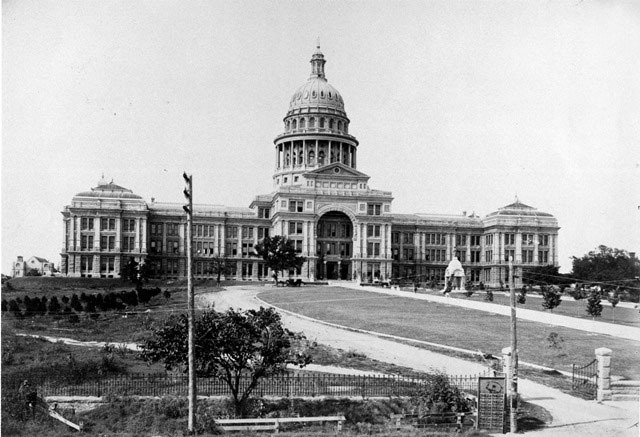 Texas hired prominent civil engineer William Munro Johnson to develop a plan for the Capitol Grounds. 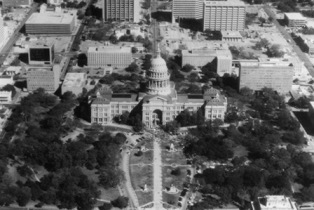 Johnson's design highlighted the connection between the front of the Capitol and Congress Avenue by featuring curving carriage drives surrounding a Great Walk of black and white diamond-patterned pavement. 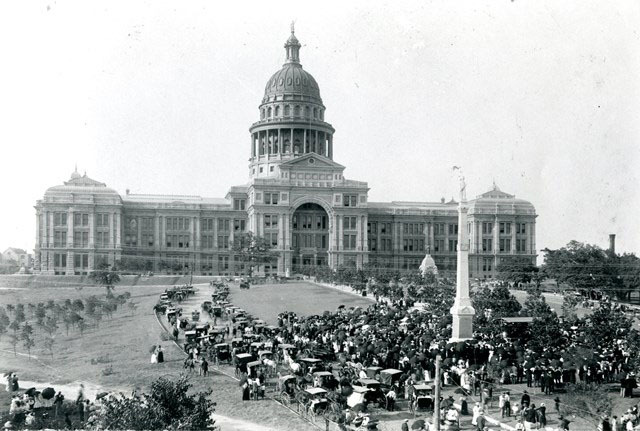 Heroes of the Alamo stands as the only monument on the Grounds, c. 1895. 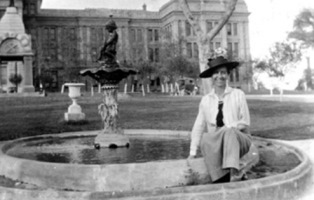 Image Courtesy Texas State Library and Archives Commission, 1936/010-3. 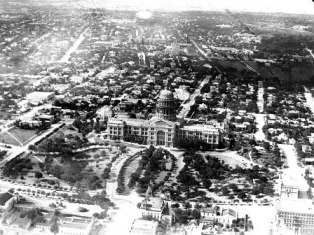 William Johnson envisioned the Capitol Grounds as a park for the citizens of Texas. The installation of iron fencing kept wandering livestock out of the park. Manufactured by Mast, Foos & Company of Oho, the fence stood on bases of granite. The iron pedestrian gates mounted at the drives and in front of Great Walk included a Buckeye seal. Crowds gathering for the dedication of the Volunteer Firemen monument, July 7, 1896. Image Courtesy Austin History Center, Austin Public Library, Chalberg Collection of Prints and Negatives, C00692. The State Firemen's Association of Texas installed the Volunteer Firemen monument, the second monument on the Grounds. A bronze statue replaced the original obelisk and granite statue in 1905. 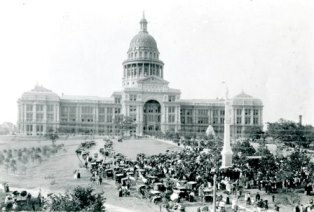 By the mid-1890s, the Grounds featured more than 100 trees and a sodded lawn. 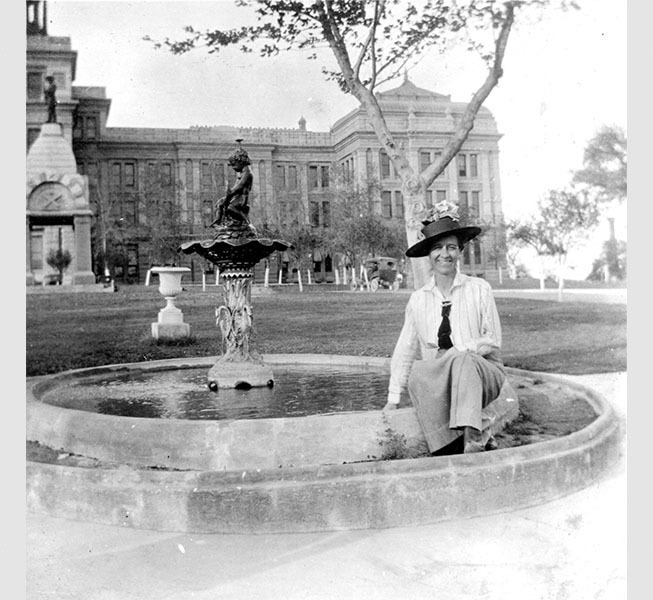 Unidentified woman relaxing by a fountain on the South Grounds, c. 1913-1917. Image Courtesy Austin History Center, Austin Public Library, Frank Jacob Smith family album, AR.2015.014(084). Fountains made their appearance on the Grounds. Two cast-iron spraying fountains in ornamental pools stood on either side of the Great Walk. An elaborate drinking fountain with an electric light over an artesian well stood on the east and dispensed warm water. A water fountain on the west side of the Grounds flowed with cold water. 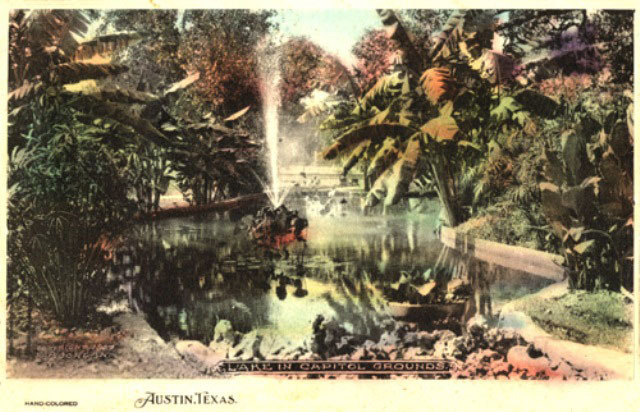 This postcard shows the grotto on the east Grounds, 1907. Two artificial lakes added to the natural beauty of the Grounds. A limestone cave-like structure, or grotto, to the southeast of the Capitol featured spraying fountain, exotic plants and goldfish. Another lake surrounded by canna lilies, ornamental shrubs and trees probably decorated the west portion of the Grounds. 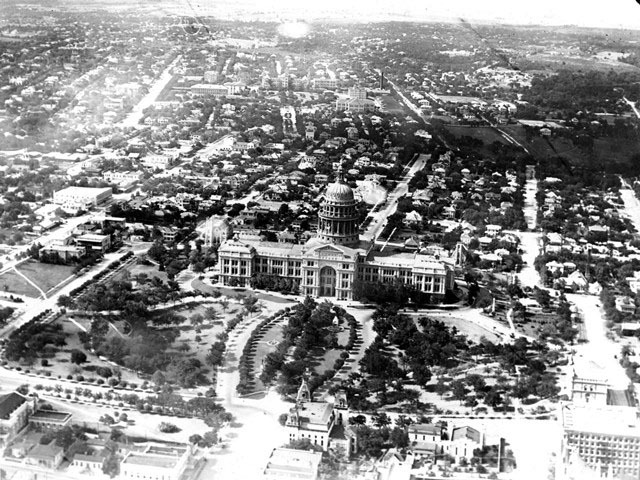 Aerial view of the Capitol and Capitol Grounds, 1920. Image Courtesy Texas State Library and Archives Commission, Austin, 1/103-5. The development of airplanes allowed for the first views of the Grounds from the air. Another change in transportation technology, the automobile, necessitated the paving of the driveways around the Capitol with asphalt. The addition of light poles and more plantings complemented the park-like feel of the Grounds. Image Courtesy Austin History Center, Austin Public Library, Chalberg Collection of Prints and Negatives, C06232. 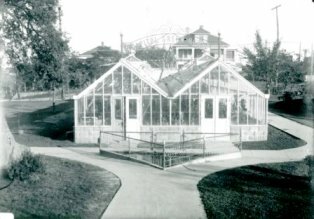 The Capitol Greenhouse, constructed in 1908 on the eastside of the Grounds, burned during a rare Austin snowstorm. 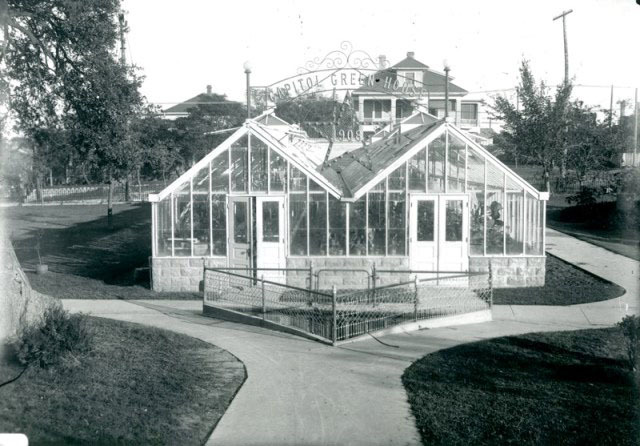 In the 1940s, a replacement greenhouse was built on the same spot. The greenhouse relocated to the State Cemetery in the 1970s and still stands today. 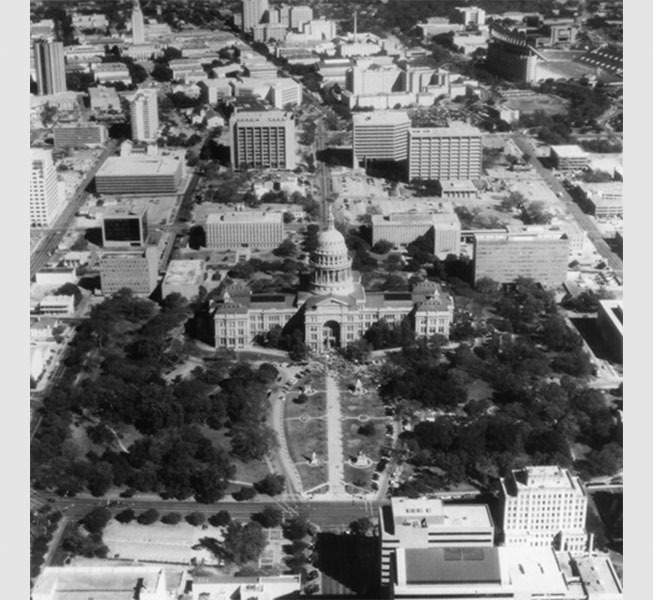 State office buildings surrounding the Capitol Grounds, 1988. By the late 1960s, Texas had constructed five new state office buildings around the Capitol Grounds to accommodate an expanding workforce. Monuments, memorial fountains, sidewalks and vegetation spread haphazardly throughout the Grounds. Impassable sidewalk on the Capitol Grounds. After a century of use, the Grounds had deteriorated significantly. The trees and lawn were in poor condition. Monuments and fountains stood tarnished. The walkways and drive were hazardous and nearly impassable. Workers repairing the Great Walk, 1995. The State Preservation Board initiated a restoration of the Grounds. The project installed new infrastructure including fire protection systems, water-conserving irrigation and handicap-accessible walkways. 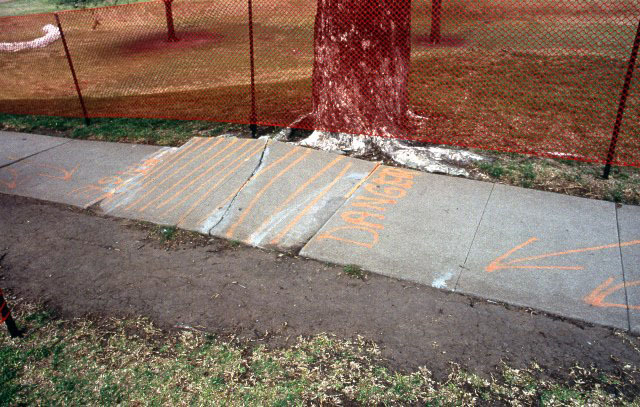 Workers reconstructed the historic Great Walk and Oval Walk to their original configurations and restored cast-iron light poles, fences and gates. 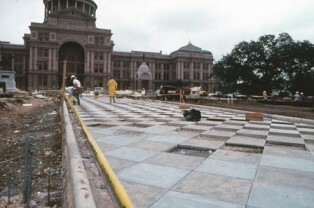 The south Capitol Grounds following the restoration, c. 1997. The Grounds Restoration cleaned and repaired statuary and monuments. Crews planted more than 180 trees and hundreds of native plants to replace those lost to old age and disease. The Preservation Board returned the Grounds to its historic and natural setting.